Today, I have for you another offering from The New Black. In addition to their 5 piece sets, they also have little duos that they call "Glimmer Twins". They offer these little duos in 4 combinations: gold, red, black, and silver. In each of these duos, you will find a solid, opaque color, along with a coordinating glitter topcoat. This post is for the golden set. FYI, like Jewel Heist, these do not have names, so I am calling them Gold Satin and Gold Glitter. From left to right you have the solid gold, the solid gold with the gold glitter topcoat, and then the topcoat by itself. The solid gold in this little set is beautiful. It is a perfect muted, light gold with a satin finish. I did have a little issue with brushstrokes, but in this instance, it didn't bother me. They just added to the satin feel of the polish, IMO. I have a love/hate relationship with gold polishes. I adore then in the bottle and then I hate them on me. One of my biggest lemmings is Chanel Gold Fiction and yet everytime I find it for a reasonable price, I never pull the trigger because I feel it would look terrible on my nails. I don't feel this way about this polish. The gold is light enough to be wearable on even the most untanned skin out there. Also, there is no shimmer in this polish. It's simply a golden satin. Gorgeous. 2 coats. 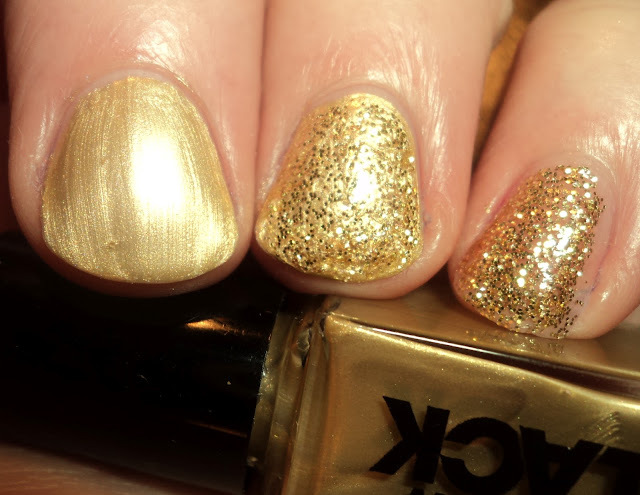 The golden glitter is beautiful, and quite similar to Julep Oscar that I should you a few days ago. Oscar does seem to be a bit more packed with glitter, but side-by-side, these look identical in color to me. The picture above is almost at opacity and it is 3 coats, so you could certainly get there with this polish, if you would rather not use it as a topcoat. Speaking of using as a topcoat, I think the look on my ring finger with the golden glitter over the satin is probably my least favorite way to wear this set. I think they are nice polishes separately, with the satin being a winner for me, but together, I just don't like the look at all. For me, the golden satin is real reason to buy this set. It is a perfect gold polish, I just wish it were bigger. The set sells for $10 for 2 0.125 fl oz bottles, and is available on drugstore.com, HSN, and at Nordstrom.